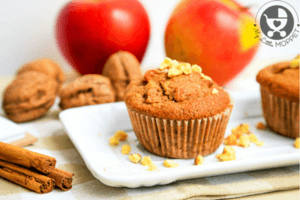 Muffins are an all time favorite among kids – and Moms! The kids love it because of they think of it as a fun food, but the Moms love it because of the convenience. 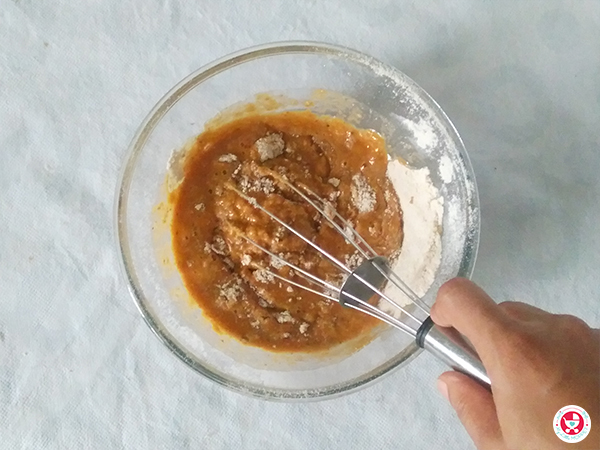 You just mix wet and dry ingredients, add together and bake! 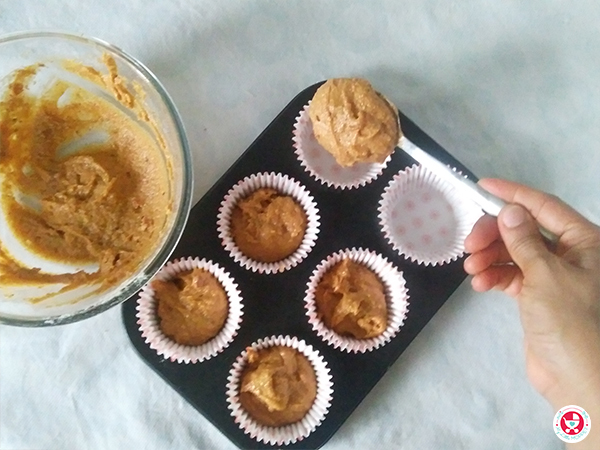 Muffins are also a great way to sneak in healthy ingredients, like we’ve done here today in our Dates Muffins Recipe. 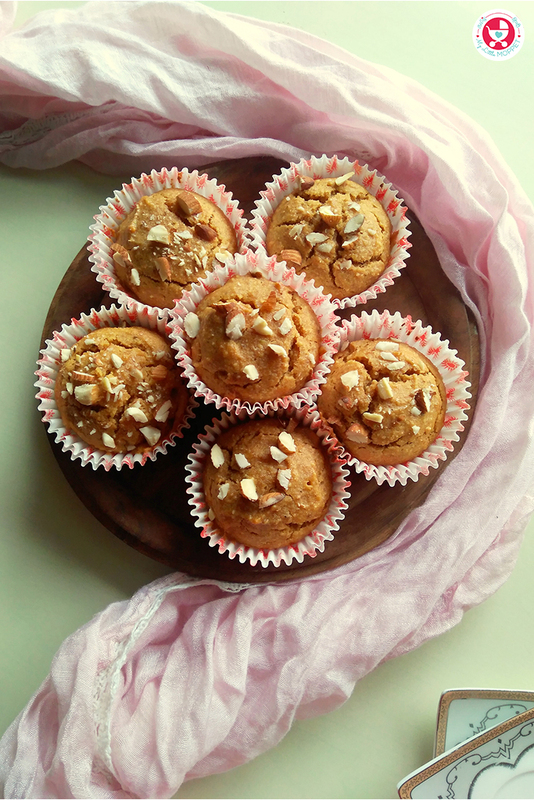 These muffins are egg-less, butter-less and sugar-free, using jaggery as a sweetener. 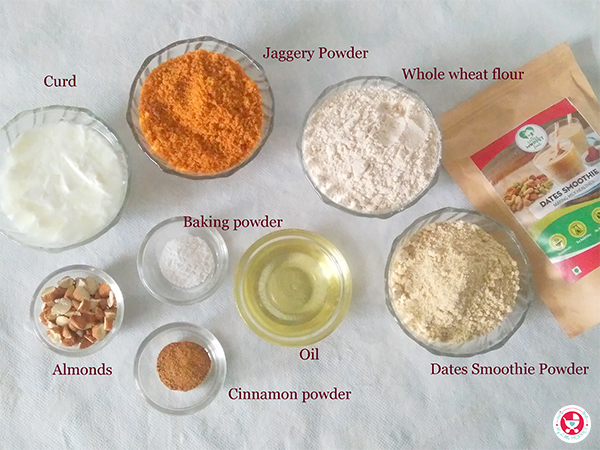 Along with the nutritious My Little Moppet Food’s dates smoothie mix, this recipe is a winner! 3. Sieve whole wheat flour, dates smoothie mix, cinnamon powder and baking soda (if using) twice. These are our dry ingredients. 4. Mix the dry and wet ingredients. 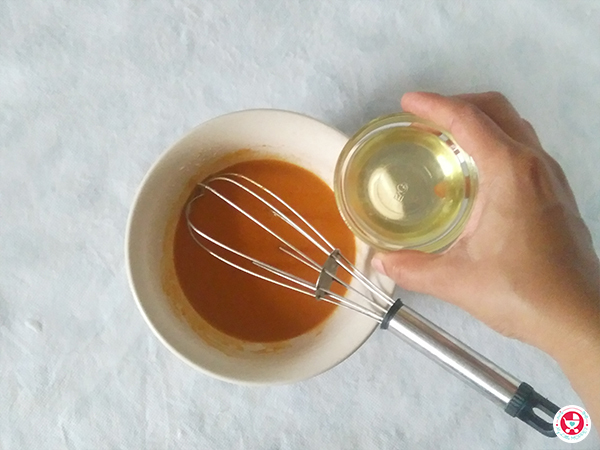 Do not whisk, just fold. 5. 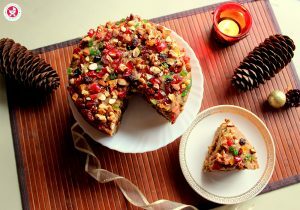 Add half of the chopped almonds to the batter and fold once again. 6. Spoon out the batter into each muffin cup upto 3/4 of its capacity. 7. Tap the muffin tray to release trapped air bubbles. 8. Now top each muffin with some chopped almonds and transfer the muffin tray to preheated oven. 9. Bake the muffins at 180 degrees Celsius for about 20 minutes or until the tester toothpick comes out clean. 10. Allow the muffins to cool down on a wire rack before serving them. 11. 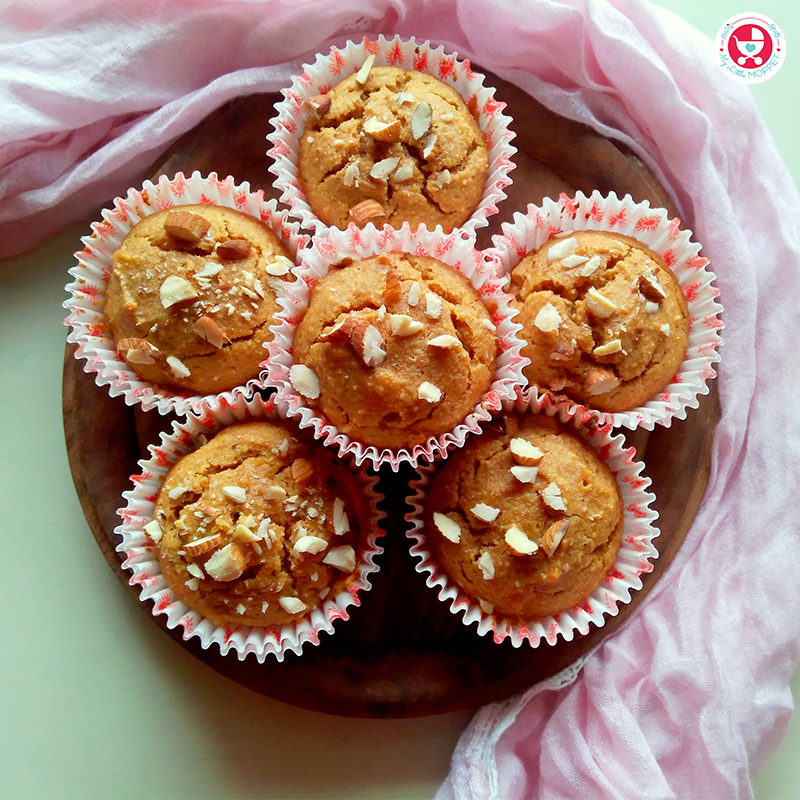 Keep the left over muffins in an air tight container at room temperature upto 2 days. I have added little baking powder in the recipe, you may skip it altogether. 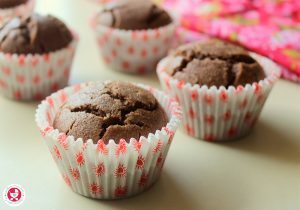 (the muffins will rise less if you skip Baking powder, but there would be no change in taste). Dates are exceptionally nutritious and good for brain development and overall growth of babies. 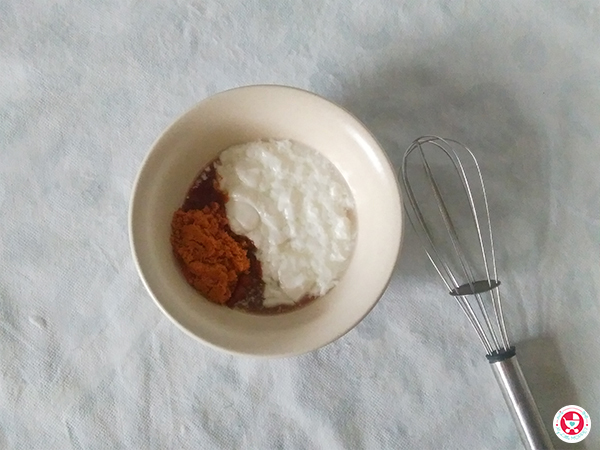 Curd is used as an egg replacer in this recipe. 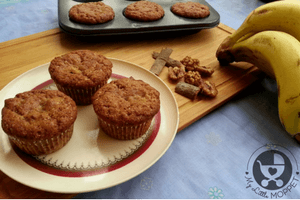 Cinnamon powder gives a nice flavor to these muffins and the almonds contribute a nutty flavor and crunch. 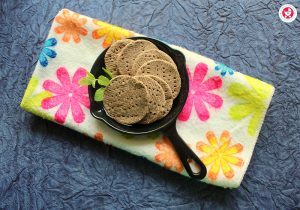 Whether you serve these delicious treats with milk for breakfast or as a snack, kids are going to love them! 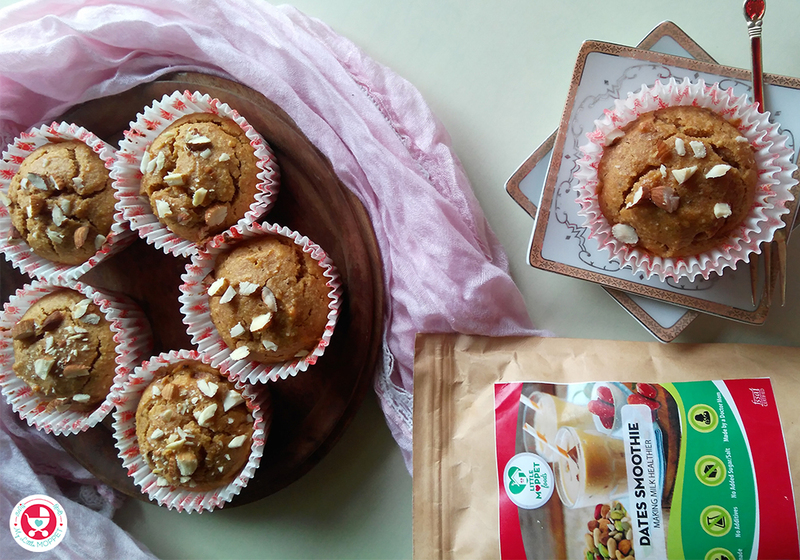 Dates muffins are fluffy nutritious treat with the goodness of My Little Moppet Food’s dates smoothie mix. 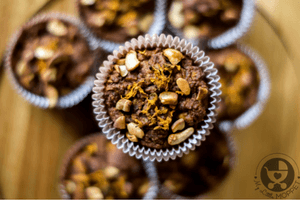 Natural sweeteners make these muffins a guilt free affair. The recipe is egg-less and butter less. 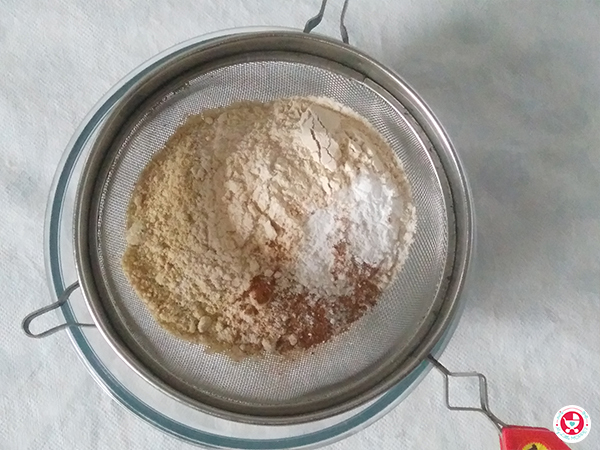 Sieve whole wheat flour, dates smoothie mix, cinnamon powder and baking soda (if using) twice. These are our dry ingredients. Mix the dry and wet ingredients. Do not whisk, just fold. 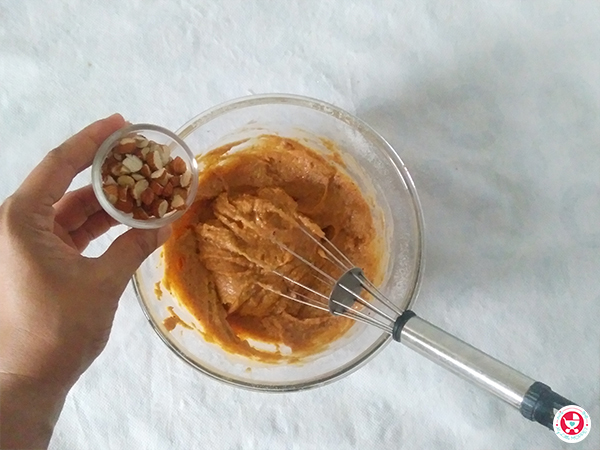 Add half of the chopped almonds to the batter and fold once again. Spoon out the batter into each muffin cup upto ¾ of its capacity. Tap the muffin tray to release trapped air bubbles. 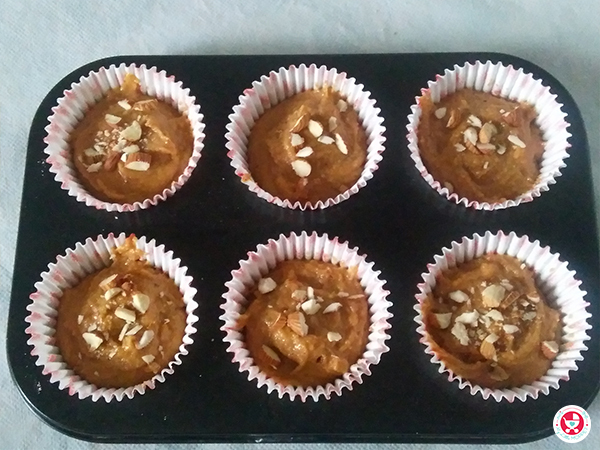 Now top each muffin with some chopped almonds and transfer the muffin tray to preheated oven. 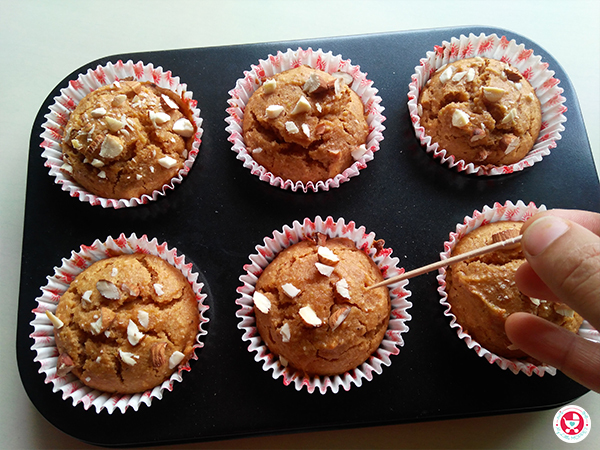 Bake the muffins at 180 degrees Celsius for about 20 minutes or until the tester toothpick comes out clean. Allow the muffins to cool down on a wire rack before serving them. Keep the left over muffins in an air tight container at room temperature upto 2 days.